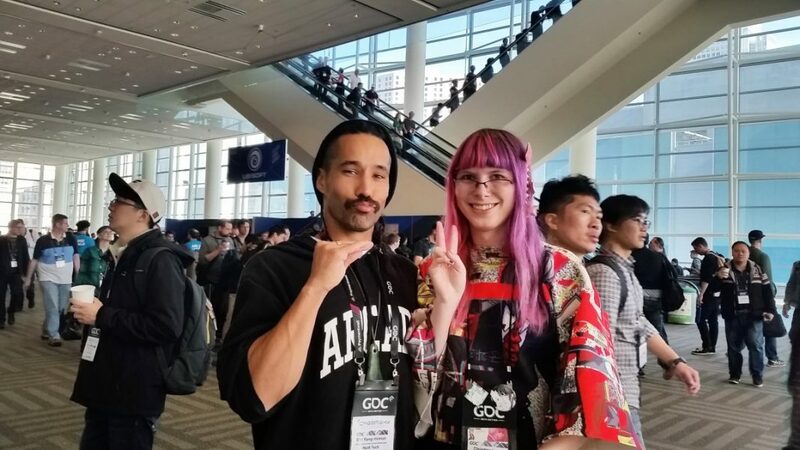 Eric Rangi Hillman with Canadian visual novelist Christine Love at the Game Developers Conference in San Francisco. A love of technology, nature and youth at risk is coming together for Eric Rangi Hillman as he develops computer games. A flurry of interest currently surrounds the Waiheke digital gaming and app development company, Her0tech, which island residents Eric and his “good bro” Jacob Whakahau have founded. As MC Billy Fluid, Eric has toured New Zealand with Waiheke dubstep producer Charlie Brown, aka Optimus Gryme, and other top Kiwi electronic music artists. Eric has also worked for about 10 years with at-risk youth, as a support worker with special needs children, and as a kapa haka teacher at Waiheke’s primary and secondary schools. For Eric, pursuing success in games development goes “hand in hand” with offering opportunities for young people, particularly those from less advantaged backgrounds. 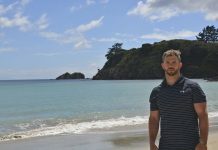 “Working at Waiheke Primary was a big motivator in getting me back connected with the kids and trying to think about a future for them. “It changed my life working with those kids at the primary school and doing tech is my way of making sure I can pay them back with something of value. “The tech industry is growing and if they can get into it young, they will be fine,” says Eric. “silicon island”, a place full of opportunities for the island’s young people. “I would love to see a culture of creatives on the island and an industry that has jobs for our youth. Eric Rangi Hillman holds up his pass to a recent international Game Developers Conference in San Francisco. He has a vision of Waiheke becoming “silicon island”, a place full of opportunities for the island’s young people. As a member of Te Whanau a Apanui iwi from the east coast of the North Island, Eric is also keen to see Maori become more involved in the technology industry. “Our breakthrough into the global gaming market will potentially help to showcase the value of our people, not only to our own communities and families, but to the world,” the Her0tech website states. In December last year, Eric and his childhood friend and business partner, Jacob, launched their first game, Bird’s Hit. With Waiheke teacher Daniel Paterson, Eric has now designed a new game, Ata, which he plans to put up for crowd funding and launch within the next few months. A prototype of the game was well received at the New Zealand Game Developers Conference and meetings have followed with the chairperson of the association, investors, artists, coders and documentary makers. “It has all picked up at a phenomenal speed. I’m having meetings every second day – it’s quite scary, but it’s exciting. Eric has just returned from an international Game Developers Conference in San Francisco that was attended by about 25,000 people and gave him a chance to meet some of the most important people in the industry. 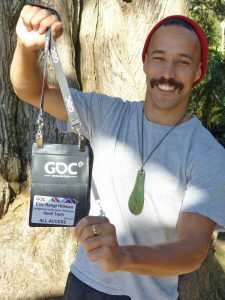 The “indigenous indie game developer” won two scholarships enabling him to attend the conference, one from the New Zealand Game Developers Association and another from the New Zealand Film Commission. Eric is clearly excited to have met some of his tech industry heroes, and to have had a chance to stand beside other indigenous game developers, as well as women and gay people in a field that is “white, male dominated”. “The women who raised me, my mother and grandmother, were strong women. If the men don’t create a safe environment for those strong women, society ends up wrecked, because men can’t tie their shoelaces for themselves,” he laughs. At the conference, the 32-year-old also learned more about virtual reality technology and how to get children involved in games development. 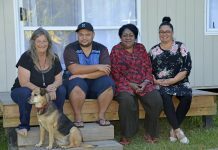 Eric, who lives in Little Oneroa with his partner and business support person Huni Mancini, says he created Ata during a particularly difficult year. 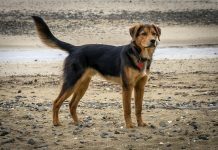 “It’s like a virtual memory lane of the island, piecing together parts of my upbringing. “The focus is on 2014, the year my mother died. Ata takes players on a virtual reality tour of Waiheke while also including elements of Omaio on the east coast where Eric spent time at his family homestead after his mother died. Players explore the island on foot, hunt for treasure, solve puzzles and bathe in a “stunning virtual natural world” as the game unfolds. Although Eric began by creating a game that includes memories of Waiheke, he hopes young people will soon be able to use it as a pilot to record their own stories in the form of a game. “For me, it’s important to bring Waiheke in because I grew up on the beach here. “Waiheke is changing, Omaio is changing, and a lot of the old stories have been lost. While the game is currently operated from personal computers, Eric hopes it will soon be able to be played on cell phones. He plans to hold his first workshop in the next few months for children aged between eight and thirteen to gain an introduction to games development. “Youth suicide has been huge here and this is the only way I could see to try and help them. “We’re trying to target the kids and the people that don’t have much, so they can feel like they have representation in the tech world. He hopes the government will provide funding for computers so that young people can learn the skills needed to pursue a career in the tech industry. “How many kids that were rough growing up have their creativity end when they get told off for scribbling in their books – and it shouldn’t. Eric describes his own upbringing growing up on Waiheke as “rough” and says this has helped him understand the young people he has worked with on the island. “I grew up without running water and in the pub culture in New Zealand in the 1980s and 1990s. “Any stuff I didn’t grow up with, I had cousins or friends growing up with. “I always knew someone going through the worst case scenario and it was always close to my heart. Although “big money” has now bought up large parts of Waiheke many families continue to struggle to stay on the island and Eric hopes helping young people gain technological skills could help them to thrive here. “How do kids sustain a future here? How many of those families I was working with at the schools have had to leave since? It’s heart breaking. “I want to get our first under 18-year-old on Waiheke buying a house for their parents off the app they sold. I don’t think that’s a fantastical thing to want. It’s a logical thing if we can create the environment,” says Eric, who is already “part time uncle” to many of the children he has worked with over the years. During his own childhood, Eric discovered a love of video games at Frank’s video arcade behind a video shop in Surfdale. He also sneaked into a friend’s house in Blackpool “at 4am on a lot of school days” to play on his mate’s Sega Mega Drive. In his early teens he learned how to develop games with a cousin and he gained web development skills at Waiheke High School. Always “passionate” about art and music, he has relished creating 2D and 3D art and music for the “simple, addictive” game Bird’s Hit, while Jacob did the programming for the game. It involves moving a bird to avoid obstacles and the process of developing it has taught the friends a lot about making, releasing and promoting games and analysing feedback. Eric continues to work as a gardener at The Boatshed Boutique Hotel in Little Oneroa and has worked in the past in viticulture at Mudbrick Vineyard and as a beekeeper in the Hawkes Bay. Far from being a stay-at-home computer geek, he enjoys deer hunting on the east coast, spear fishing and diving for kina, paua and crayfish. He hopes to develop games that can be used outdoors and that encourage young people to interact with nature. Next articleNo more plastic? Fantastic!